The question of how to eat healthy is one that almost everyone will contemplate at one time or another. There are many 'diet trends' that come and go and all this can be quite confusing. I like to keep it very simple - just eat real food, mostly from the plant world and don't eat too much. The old adage, you are what you eat is a very good diet guideline. If you eat healthy, vibrant and alive foods you will be healthy, vibrant and alive. 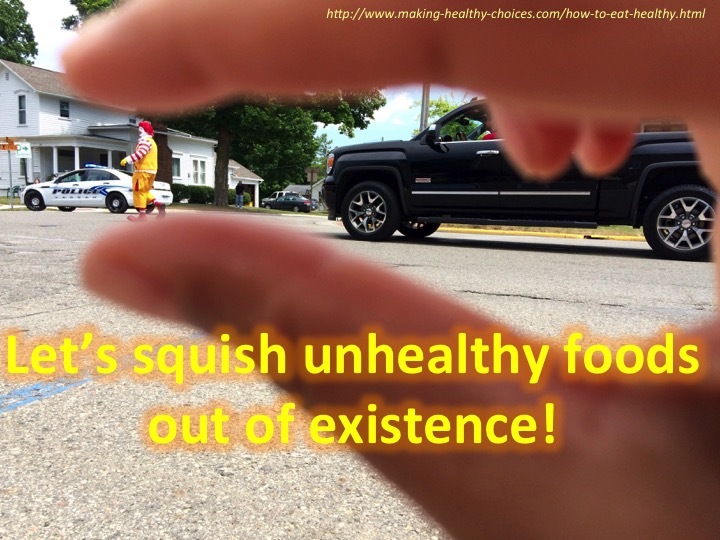 If you eat artificial and lifeless foods you will be ... well, you get the idea. What choices will you make? What's in the Stores Today? Walk into any big city supermarket today and you will see a vast amount of packaged and processed foods being sold and a lack of fresh healthy food choices. The awareness of how to eat healthy just isn't there. Go a step further and read the ingredients on those packages. It is easy to see that the contents of those boxes and cans is made up of a long list of unrecognizable items and potentially harmful ingredients. You vote with your money and the stores pay attention to what you are buying. If you choose to leave behind the genetically modified, chemically laden packages and make healthier choices the stores will be forced to stock up on those healthier choices. What is a Healthy Choice? If it came from Nature, go for it, if it came from a factory, leave it on the shelf. Look at any animal in Nature, they know how to eat healthy. 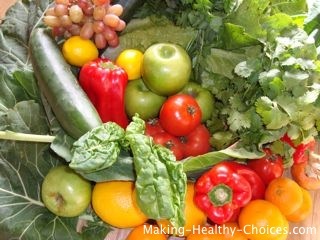 Get into the produce aisle and add to your diet some fresh, organic fruits and vegetables. Experiment and try some of the healthy fruits and vegetables that you have never tried before. Challenge yourself to stay out of those middle aisles. Making healthy choices is also important when you are away from home. Read my blog post here on healthy eating while travelling. Also very important when thinking about how to eat healthy is to eat foods local to your area and to eat the foods that are in season. Nowadays in a big city supermarket you can get almost any food from anywhere in the world at any time. But is this good? In Nature, different things grow on different places on the planet and at different times of year for a reason. The animals that live in that area are supposed to have those certain foods at those certain times ... humans included. Straying away from this, and eating all sorts of exotic and out of season foods is not healthy. A little treat now and again is one thing but if most of your fresh foods are coming from far away and are out of their natural season this will contribute to you also feeling distant, disconnected and not in tune with where you are. Sound familiar? Another very good reason to eat locally is that a huge amount of global resources goes into getting those exotic and imported foods into your local market. The health of our planet and the effect of over-using its resources is an important consideration. Eating local and in season will keep you more grounded, focused and in tune with where you are now and will also better ensure that you are eating a variety of foods throughout the year. A great way to better ensure that you are striving to meet those nutritional requirements is to get variety in your diet. Every time you shop, look for different greens, different fruits and vegetables, different nuts and seeds, different protein sources, etc. Shopping at farmers markets or growing your own food is a wonderful way to ensure variety as certain things are in season only at certain times of the year. Many people tell me that, once they start thinking about how to eat healthy, they just don't know what to make for meals. I find it very helpful to shift your mindset away from the concept of time specific foods. Somewhere along the way we all got conditioned to believe that eggs/cereal is for breakfast, sandwiches are for lunch and fish is for dinner. It doesn't need to be this way! As long as you are choosing real, nourishing, high vibrational foods, feel free to eat any foods at any time of day. For example I make an amazing chocolate pudding that, in my younger years, I would have only ever thought of having as a dessert after a meal. But why??? Nowadays I will eat this yummy dreamy bowl of chocolate goodness as my breakfast, lunch, dinner or a snack - because it is healthy and nourishing I am happy to eat this at any meal time not just when old programming dictates. Same goes for any of the 'healthy desserts' or 'snacks' I make. In terms of how to eat healthy, avoiding GMO foods is huge! GMO refers to genetically modified food. This is food that has been altered at the genetic level. Messing with Nature like this is a dangerous game to play! GM (genetically modified) foods are no longer in their natural state. The potential for GM foods to damage the health of our bodies and of the planet is huge. This has become a big problem nowadays as there is now quite a lot of GM foods on the market. Many products are still not required to label if something is, or contains a GM food. So, unless you are proactive and do your own research you may not even know that you are buying and ingesting GM foods. You may be surprised to know that many of the packaged foods on the store shelves contain GM ingredients. Use this non-GMO shopping guide to help you as you shop. In it, you will find plenty of helpful information as well as a list of many brands that are non-GMO. The key to learning how to eat healthy is balance and making changes slowly. Big changes are usually harder to sustain for the long term so go slowly, always be gentle with yourself and give your body time to adjust to your new healthier choices. This is not about giving up all the packaged junk food overnight. If there are things that you enjoy and are not ready to give up, don't. Instead, pick something else to give up that is easier or don't give up anything at all right now. Choose to add in a healthy food choice instead of taking something away. Pick a change that you are ready to make and do it. How about adding in one green juice every day? Or an organic salad? Or a piece of fruit in the morning before anything else? These healthy choices don't have to be grand, many little changes over time makes a brand new person in the long run. You are the artist creating the work of art that is you, and the brush strokes are the choices you make each day. I have designed a 'make a healthy choice program' that helps you to incorporate healthy choices, try it for yourself and see what you think. Learning about the most detrimental parts of our modern diet (Standard American Diet or SAD diet) will show you the most important things to avoid and this may help you to decide what changes towards healthy food choices you want to make first. Like mentioned earlier, you are what you absorb (not just what you eat). How you eat plays a big role in understanding some tips for better digestion (ie absorption). I start my day with good quality water followed by a fresh green juice or green smoothie and then after that every day is different. I have fun creating healthy food recipes (mostly raw and vegan) and I choose to eat instinctively, tuning in and seeing what it is my body is asking for. Water is a very important part of a healthy diet. Drinking enough water is a crucial part of your overall holistic health. Along with drinking enough water it is important to get enough water from high water content foods which are raw, organic fruits and vegetables. Click here to read more about drinking enough water and for an abundance of information and tips on water as well as some great homemade flavored water recipes. What do we do about cravings? As you practice how to eat healthy, you will find that cravings can often be satisfied by healthy food choices that are also nutritious. But while transitioning away from unhealthy eating habits constant cravings can be a challenge. First, make sure you are staying hydrated all day long and then no matter what else you are eating be sure to keep adding in the really great nourishing foods. The more you are well hydrated and the more nourishing foods you are eating the less cravings will have a hold on you. Then, as you continue on, keep looking for healthier food substitutions for anything you are still craving. You may be surprised at all the healthy choices out there that taste amazing and are good for you. Aligning yourself with how to eat healthy can be fun and enjoyable. I realize that becoming healthier and remembering how to eat healthy can be very challenging. Every one of us is on a unique journey. Each person's pace is different and each person has different things to learn at different times. Know that you are loved and know that you are not alone. Please continue to try your very best to make healthy choices .. you are worth it! Isn’t that where all the fruit is?